« Need to Control a Ridiculous Amount of Servos? This time of year is very exciting for students and teachers as they ramp up for competitions in the new year. 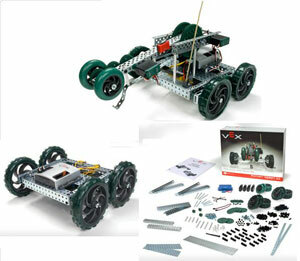 VEX Robotics has been a very popular choice in the Educational Robotics field and has recently expanded their product line! The baseline kits have been upgraded to the Protobot Robot Kit, which is a versatile wheeled platform and make the perfect starting point for any competition. Around the Protobot three different starter bundles are offered, the Radio Controlled Starter Bundle, the Autonomous Control Starter Bundle, and the Dual Control Starter Bundle. These give students and teachers a headstart by providing all the essentials to get started building for their competitions no matter the type or control method. Trossen Robotics would like to wish all of those participating in this upcoming year’s competitions the best of luck! This entry was posted on Friday, December 12th, 2008 at 10:49 am	and is filed under Competitions / Contests, Front Page News, New Kits / Products, Product Spotlight. You can follow any responses to this entry through the RSS 2.0 feed. You can leave a response, or trackback from your own site.